There is just that something that comes with movies about making movies and how the behind the scenes dynamics somehow connect more and serve as dramatic material in their own right that gives, at least certain audience members, a rush of fascination especially when paired with a film or some other piece of pop culture that has become a mainstay over time. There is no doubt that the 1964 Mary Poppins film has become a soft spot for generations of children that have fallen in love with the songs and the characters that are now iconic, but what many people even fail to realize is that Mary Poppins herself was not the creation of the Disney studios and it's figurehead Walt Disney, but instead of a small English woman by the name of P. L. Travers who took the nanny very seriously as she was more than a fictional character to her creator but the heart and soul of her childhood that would shape the woman she became and the code she would live by. 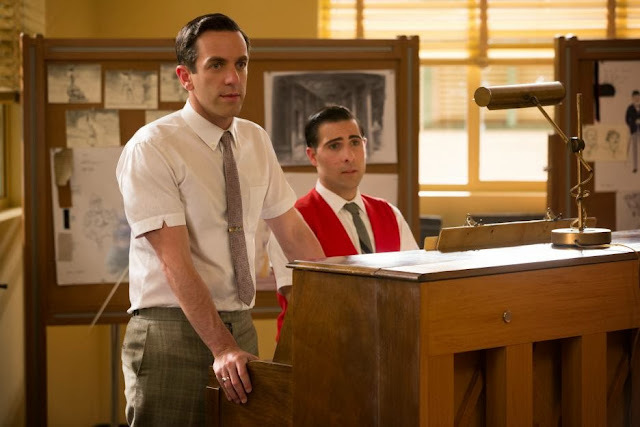 This is made apparent in Saving Mr. Banks until the terribly particular author comes in contact with Mr. Disney and is able to find common ground with a man who'd made his fortune from portraying himself and pumping out products that conveyed the happiest man the world could offer. There is a complex relationship at the heart of this film that gives us not only a look at the shaping of one of Walt Disney's productions in the latter half of his career, but it also chronicles the creative process in a way that you realize the depths to which some people hold onto moments past in their life and how it inspires what is the centerpiece of their existence to the point they find it hard to let go, to let it become something new and how that can both be a weight lifted and a new burden all at once. I began the film, excited to see what was in store for the audience as, obviously, I love movies and so I love movies that detail the industry and how other movies are made, but as we are introduced to Miss. Travers and her constant scrutiny I was at first repulsed by the way in which she not only treated the people involved in the production, but everyone around her to which she is then somehow able to become a more respectable figure whose complexities don't excuse her attitude, but endear her more to the audience which is credit fully due to the performance of Emma Thompson. Walt Disney (Ton Hanks) attempts to butter up P.L. 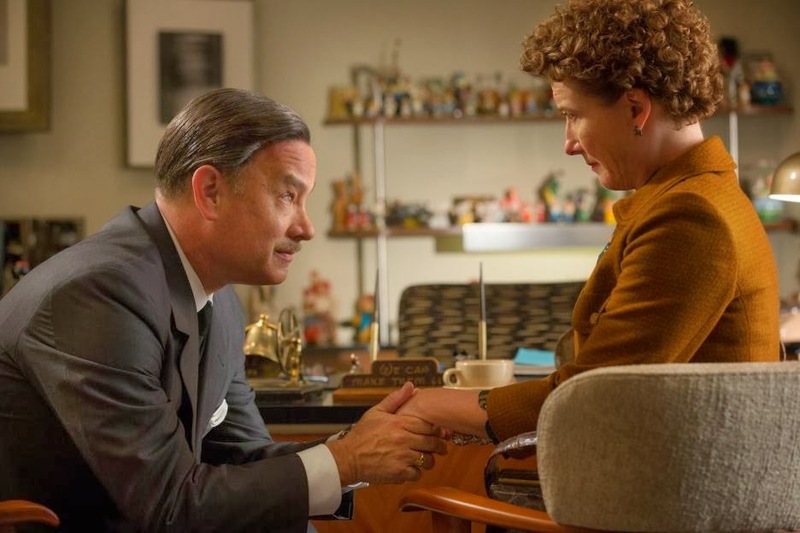 Travers (Emma Thompson) in Saving Mr. Banks. Beginning in 1961 we are introduced to Miss. Travers (as she prefers to be called) and her agent discussing the fact she has little to no money left and as she's not written any new material for quite some time and it is in her best interests to consider Mr. Disney's offer to make a motion picture based on her beloved Mary Poppins. We've all seen the trailers where it is made clear that Disney's quest to obtain the rights pits him against this uncompromising writer who is somehow unable to resist the charm and spectacle of what Disney brings to the table. As this is produced by Disney studios it is somewhat funny to see the way in which this kind of competition is staged. Disney is an admirable man, no doubt and Hanks plays him with an air of mixed confidence and delightful optimism in everything he does. He is a man who made his name on an animated mouse that took the world by storm and he was no doubt in love with that character as much as Travers treasured her dear Mary Poppins. And so, I wondered why there might even be a level of misunderstanding between these two artists that come from a similar place and share what could ultimately be summed up as similar values. There is even a point in the film where Disney speaks to his assistant about how he felt when a larger corporation tried to purchase Mickey Mouse from him and how hard it would have been to let him go and not dare to create his own empire. I also wondered why Travers might not try to pitch the adaptation to other studios, but despite the fact she might have that surely wouldn't be documented or mentioned in this film. What we have here is a story loose on concrete facts and vivid in its interpretation as far as the true relations between Travers and Disney go, but what I think allows the film to rise above the easy target it could have been with its credentials and position on the subject matter is that it essentially goes back and serves as the movie Travers would liked to have seen adapted from her stories through the function of flashbacks to her childhood. It may not capture the make believe or fantastical elements of her Mary, but it captures what is hopefully the spirit of her drive and reason for why she was the way she was and why she so badly needed to be that person. It was for two weeks in 1961 that Travers went to California and Walt Disney pulled out all the stops overwhelming Travers with a Beverly Hills Hotel room filled to the brim with Disney memorabilia and on the working days bombarding her with screenwriter Don DaGradi (a playful Bradley Whitford) as well as hoping to convince her to being open to the idea of the film being a musical with the help of the Sherman brothers, Robert (B. J. Novak) and Richard (Jason Schwartzman) and their lighthearted tunes. This storyline is clearly where the emphasis was placed in terms of marketing and star power, but there is a tug of war going on in this film to the point it feels like every other scene is alternating with the backstory of Travers and how it influenced her writings. In those flashback scenes, while at first feeling somewhat out of place and forced, we are eventually taken to a rather dark space in that these were not happy people yet they enabled themselves to live in a world where they were constantly surrounded by small children and the natural innocence and joy their existence brings with them. Young Miss. Travers or Ginty (Annie Rose Buckley) as she is so lovingly referred to by her father, the inspiration for the titular Mr. Banks, is growing up in Maryborough, Australia in 1906 and is seemingly embarking on a new adventure as she and her family move to a new house in a small town where her father has acquired a new job as the local bank manager. Travers Goff (Colin Farrell) is a man who relies heavily on the drink though and it is well known throughout the local community. His wife, Margaret (Ruth Wilson) is clearly unsure of herself and overwhelmed when the thought of taking on the role of a mother is pressed down upon her. There is nothing singled out in terms of why she feels this way or has come to think of herself as being unfit, but it is understood both by the audience and by Thompson's Travers in that it was simply not a role everyone was cut out for. These small details that hint at what we saw in the Julie Andrews picture are nice nods, but it is Farrell's performance and the retrospective of seeing a young Travers that allows these flashbacks to become more than just a function of the storyteller. They emphasize the scene they either follow or precede and build upon the one another to result in the greater effectiveness of the film as a whole. The Sherman Brothers, Robert (B.J. Novak) and Richard (Jason Schwartzman), compose the classic Disney tunes. It is tough to like Thompson's P.L. Travers right from the get go as she looks down upon anyone not sharing her views or living in accordance with her particular lifestyle and just as you might expect her character arc makes a turn towards the more accepting point of view by the conclusion (if that is a spoiler, I'm sorry, but that much is spoiled by the trailer and the real reason to see this isn't story revelations but the value in getting a peak behind the curtain). Thompson is hard to dislike as an actress, but even here she is able to make the quips and complaints of Travers someone we are interested to understand rather than simply writing off as a picky witch. The film conveys convincingly why this story means so much to her, but further why the small details are so critical to her when being considered for the film representation. There is one scene in particular that resonated more than any other with me and that perfectly symbolizes how well director John Lee Hancock (The Blind Side) and screenwriters Kelly Marcel and Sue Smith have blended the two overlapping stories they are telling here. Walt Disney has requested the Mr. Banks in Mary Poppins have a mustache, but Travers is keen on the fact he is clean shaven. It seems insignificant and is even highlighted by the first real push back we see from Robert Sherman in that he calls out whether or not Mr. Banks having a mustache really matters. The scene then cuts to Farrell shaving his chin with his small Ginty watching on below and asking why he does such a thing. Farrell's Travers replies with a statement asking what kinds of kisses she prefers and that a man should always be clean shaven for the sake of his young daughters cheeks. It is a touching moment that connects with the older Travers in the most distant, but critical memories of her mind and it is in Thompson's performance that we see the pain of not being able to let go and give up what has been so precious and inspired her throughout her life. Farrell plays Travers with such wide-eyed enthusiasm it is pure joy to see him in a role that doesn't have him lurking in the shadows, but the aspects that do lean toward the dark recesses of life give the actor an opportunity to show great range and deliver a fine and unexpected performance that truly gives his adult daughter his vivid imagination while instilling the restraints on the indulgences that caused his downfall. 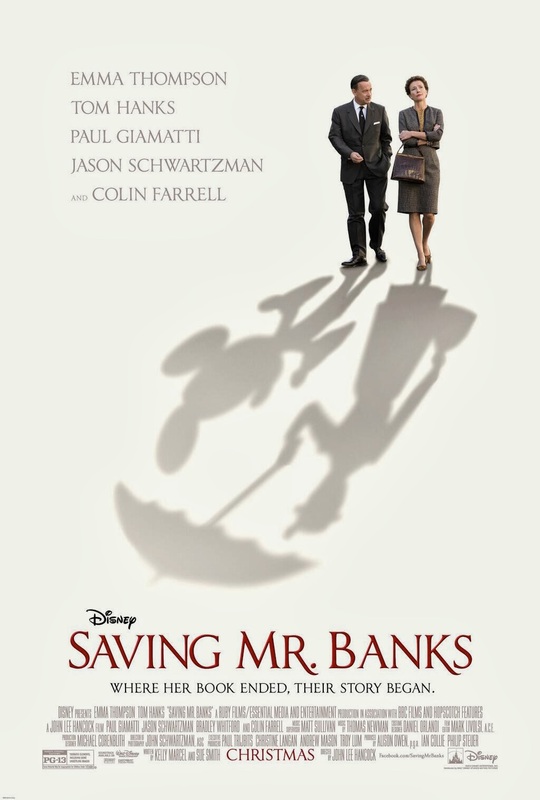 Saving Mr. Banks is an intensely engaging film if not a bit of a schmaltzy one that teaches us it's not always best for the soul to remember how things actually happened, but to allow one's self to move past it and not live a life dictated by the past.